I noticed, that IntelliJ reported the following error: “There is more than one bean of QuestionCategoryRepository type”. It seemed wierd to me, so I went ahead and started my application. The context was built successfully and there were no problems with the startup at all. annotation on my class that is used for persistence related configuration. The scope of this annotation was involving the package where I had my repositories defined. This is why IntelliJ believed, that there are two definitions. on my configuration class, pointing to the packes where my repositories reside. It turned out that I can remove both the @Repository annotation and the @ComponentScan as well, becauses the @EnableJpaRepositories was enough to detect my repositories. Of course, @ComponentScan might need to be kept if it is for scanning some other classes. Return the errors in the response to the form submit request (POST request usually). Redirect the user to the form and return the result from this new request. The first option has a drawback that if the user refreshes the page after we return with the response, the form will be resubmitted the same way as before (also he’ll see the confirmation popup asking if it is okay to do that). On one hand, most of the users won’t even understand the situation, on the other hand if the user decides to resubmit the form, sometimes unwanted situations might happen. Also, another case to consider, if the user just wants to refresh the page to get an empty form, he’ll not succeed because he’ll still see the errors and filled values from the previous submission. You can see that we have here a standard spring controller with two methods. The first method serves the GET request for the account creation page and the second one serves the POST request. What we wanted to achieve is if the POST request is performed and there are validation errors, then the request is redirected to the GET handler with the errors and form field values still populated. In this, we have to populate these to the RedirectAttributes instance. For the BindingResult you have to specify the class with the full package name and contatenate the model’s name to the end. The model must be added with the same name as you were using in this method. If we redirect from the POST handler, because we added the flash attributes, the model in the GET handler will be automatically populated with these. However, if we reach the GET handler with just a regular page request, without anything added as flash attributes, we need to manually add the our form backing object (createAccountModel) to the model. Spring’s validation support is widely used to validate objects. For example, it can validate models that are coming from user submitted forms. Validation is happening based on annotations that you can put on the fields in your model. These annotations are not part of Spring, external libraries must be used. The most common is the javax.validation package with the hibernate validator implementation. The values to be validated could be decimal values. These can be represented by a number of different types. Probably the two most common types that pop into your mind are float and double. These could work okay, but because they are not exact numbers, just approximations, depending on the validation implementation, there could be some false results. The best idea for validation is to use the BigDecimal type with the @DecimalMin and @DecimalMax validation annotations. It might seem like a hassle to deal with values of this type, but actually it’s pretty straightforward. You just have to use method calls instead of numeric operators to add / subtract / etc. values. In this tutorial I am going to show you, how to set up a basic web application using Spring Boot and Maven. The web application will have a single “home” page, rendered using a spring controller and a jsp file. A basic Spring Boot web application requires very little configuration in the POM. We only have to include one dependency (apart from the servlet api needed for using jsp views). This is the spring-boot-starter-web, that transitively contains all other dependencies that are required for the spring controllers, logging etc. In the plugin configuration there is nothing Boot specific. We just set the Java version using the maven-compiler-plugin and also set the failOnMissingWebXml to false, because we deliberately don’t have a web.xml file. A spring boot application can be initialized by a very simple class containing a main method. @Configuration marks the class as a source of bean definitions for the application context. @EnableWebMvc is automatically added when Boot sees spring-webmvc on the classpath. This flags the application as a web application and activates key behaviors such as setting up a DispatcherServlet. @ComponentScan tells Spring to look for other components, configurations. The @Component annotation is automatically added, but by default it only looks for components in the current package, so we needed to override it, to look for components in the parent package. This way, it’ll see our controller also. Extending the SpringBootServletInitializer is required to be able to deploy the application as a war file to a container (e.g. Tomcat). It is actually an implementation of the WebApplicationInitializer interface, that you would use when you want to create a web application without Boot. That’s it for the application startup. Our controller is plain and simple, just returns a view without passing any parameters. For this controller to work, we also have to specify a view resolver in a configuration class, that tells Spring where to find the view files based on their names. To launch this application, you just have to copy the war file created during build to a Tomcat container. You can download the working example project here. This tutorial describes how to create a simple Spring MVC web application statring from a basic Maven project. We set up the required directories and files by hand, almost nothing will be pre-generated. 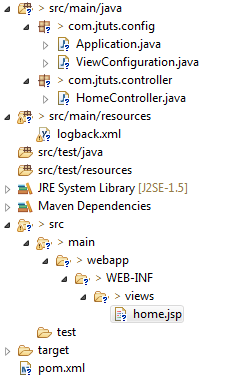 For configuration we use only java classes and no XML files (except for the pom.xml for Maven, of course). Looking for an XML configuration solution? We have an article on that as well. 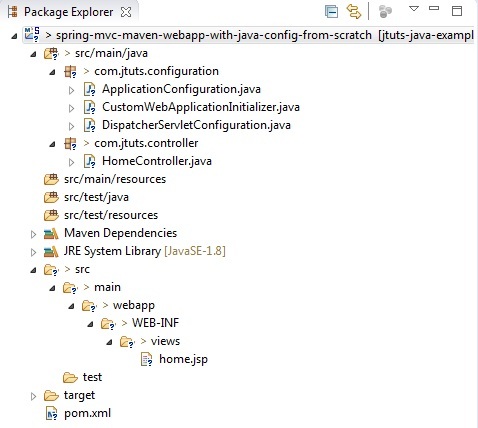 You can check it out here: Creating a Spring MVC Maven web application from scratch. The spring-mvc dependency will include all Spring related functionality. The javax.servlet-api depencdecy contains the interfaces and classes that enables us to use servlets in our application. The maven-compiler-plugin configures the compilation process of Maven. In this case we set that our source code must be compatible with at least Java 1.8, and we want our compiled program to be executable with Java 1.8 and above. The maven-war-plugin is just there to set the failOnMissingWebXml property to false, because otherwise STS would report an error that we don’t have a web.xml. Our application needs a point of entry where it’s startup process begins. We set up an application initializer class for this purpose. In case of Java config we don’t have a web.xml, so we need to define the application initializtion related stuff in a class. A class, that implements the WebApplicationInitializer interface, and Spring will call it’s onStartup method, when starting up the application. We create this, and further configuration classes in the com.jtuts.configuration package. First we create a root WebApplicationContext for the application. This application context will contain and manage all the beans defined. We also tell the container the manage the lifecycle of this application context. In the following lines we create a dispatcher context. Based on this context, we create a servlet called DispatcherServlet and add it to the container. The job of the DispatcherServlet is to take an incoming URL and find the right combination of handlers (generally methods on Controller classes) and views (generally JSPs) that combine to form the page or resource that’s supposed to be found at that location. Then we set the loadOnStartup value. A value of >=0 means that the servlet is loaded when the web-app is deployed or when the server starts. A value < 0 means that the servlet is loaded whenever the container feels like. Also, the container must guarantee that servlets marked with lower integers are loaded before servlets marked with higher integers. The container may choose the order of loading of servlets with the same loadOnStartup value. Finally, we map the DispatcherServlet to the root path (/). This makes it the default servlet, that means, that it will handle all requests that does not match another servlet’s mapping. This completes the initialization process. But as you might have noticed, we have registered two classes. The ApplicationConfiguration will contain configuration for the application context and the DispatcherServletConfiguration will contain configuration for the dispatcher servlet. Let’s look at them in detail. In this class using the @ComponentScan annotation we configure the location of our Controller beans. We also set up a view resolver that will determine how to map view names into JSP files. The prefix property’s value will be prepended to the name of every view we request and the suffix property’s value will be appended to the requested view name. For example if our controller returns the view name “login“, it will be mapped to the jsp: “/WEB-INF/views/login.jsp“. The @EnableWebMvc is the same as the <mvc:annotation-driven /> in the XML version. It enables a couple of spring features like mapping requests to controllers using the @RequestMapping annotation, validating form data with the @Valid annotation and so on. This class will contain the configurations related to the application context. Anything that is not related directly to handling incoming requests. Currently it is empty. We have a very simple controller, that is mapped to the /home path, and returns the “home” view name. We have a very simple JSP for the home page. It only contains some basic content so we know that our application is running fine. To deploy the application to a Tomcat8 server you just have to copy your .war file located in the target folder, into tomcat-installation-path\webapps . Then start up the server by launching startup.bat (windows) or startup.sh (linux). You can download the working project here.